Arrive at Bangkok and transfer to hotel. play_arrowReclining Buddha (Wat Po), The Grand Palace, Emerald Buddha (Wat Phra Kaew), Klong (canals) of Thonburi, Wat Arun. Important: Please note that for visiting the Grand Palace, you will be required to wear proper attire (no bare shoulder, bare knees or strapless-heel shoes). Shoes must be removed before entering all temple buildings as a matter of respect. play_arrowDamnoen Saduak Floating Market, Bridge on the River Kwai, War Cemetery of Allied Prisoners, JEATH Museum. 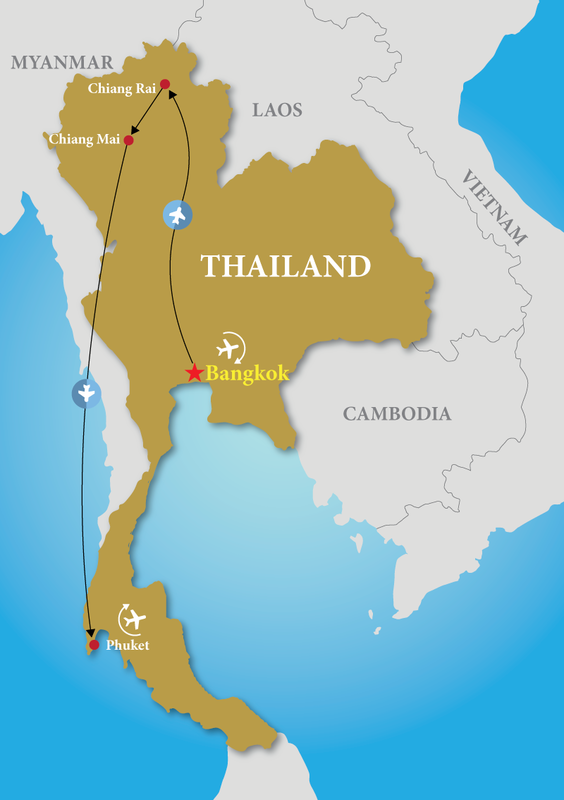 Transfer to airport and take flight to Chiang Rai. Transfer to hotel. play_arrowMain Market, Wat Phra Kaew Chiang Rai, Wat Doi Thong, Khin Meng Rai’s Monument, Wat Rong Khun. 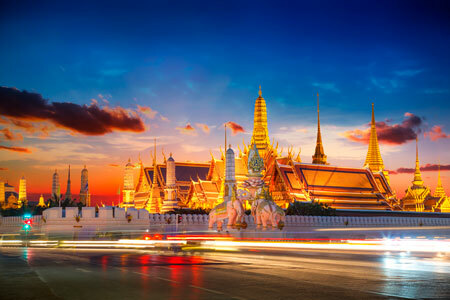 Transfer from Chiang Rai to Chiang Mai with sightseeing en route. Check in to hotel in Chiang Mai. play_arrowExcursion to Akha and Yao tribes villages, Chiang Saen (a small town on the bank of Mae Khong River), Golden Triangle, Mae Sai (northernmost town of Thailand and Myanmar), Hot Spring at Wiang Pa Pao. Full day learning elephant (Join-in Tour). play_arrowDrive to Mae Taeng Valley, Learning elephant at Elephant Nature Park, Feeding and bathing the elephants. play_arrowKhantoke (Northern Thai Cuisine) Dinner with Hill Tribe Dancers (7:00 pm – 10:00 pm). play_arrowWat Phrathad Do Doi Suthep, Meo Hill Tribe Village on Doi Pui. Transfer to airport for flight to Phuket. Transfer to hotel. 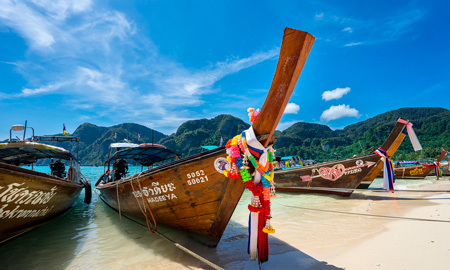 Full day Phi Phi Island Speedboat Tour (Join‑in Tour). Farewell to Phuket. Transfer to airport.